The Winegard Carryout Tripod Mount offers a sturdy ground anchor with adjustable height and leveling settings for your Winegard Carryout Satellite Dish. Never worry again about your expensive Winegard satellite dish falling in a puddle or being knocked over by the family dog. With the Winegard carryout tripod have peace of mind knowing your satellite dish will be securely mounted off of the ground with three sturdy legs and a ground anchor for added support. The tripod mount is easy to set-up and the legs detach to help you save on storage space. Attaching the carryout satellite is as easy as inserting the satellite legs into the mounting holes and turning. Securing your satellite to the tripod has never been simpler! One easy step and you can get back to relaxing. If your campground is uneven or you want to raise the tripod mount, no worries! The legs of the Winegard carryout tripod mount are adjustable for leveling and height ranging from 14.5 inches – 22 inches. The Winegard Carryout tripod mount is compatible with the Winegard carryout GM-1518, Winegard Carryout MP1 Portable Manual Satellite GM-MP1, Winegard Carryout Anser Portable Satellite Antenna GM-5000, Winegard "RealTree Camo" Carryout Automatic Portable RV Satellite Dish GM-1599 and Winegard DISH Pathway X2 Portable Satellite TV Antenna PA-6002. 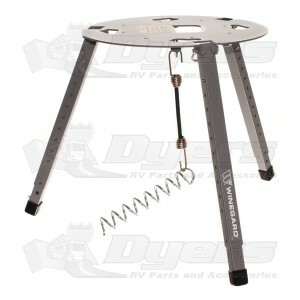 The Winegard Carryout tripod mount also works with the VuQube portable satellite TV antennas. Adjustable height & leveling settings (14.5“ - 22”). Secure unit with anchor loop. Quickly disassembles for compact storage. Exactly what we expected...the tripod fit the Pathway X2 perfectly. Absolutely no complaints. Can be frustrating to put together and break down each time. I've taken to leaving it set up and carrying it in the ruck this way. I'm sure Winegard could design a much better tripod of they wanted to! Very useful when there is not a picnic table available and not using the truck to set up. Recommend a tent stake to use as a anchor hold. I think this mount should be about half the price for what it is...but it works great and does what it's suppose to do. I have no complaints with the quality or functionality of the product, but the mark up on this item must be around 500%!!! This mount should sell for around $29.99 - $39.99 (at the most)!! !